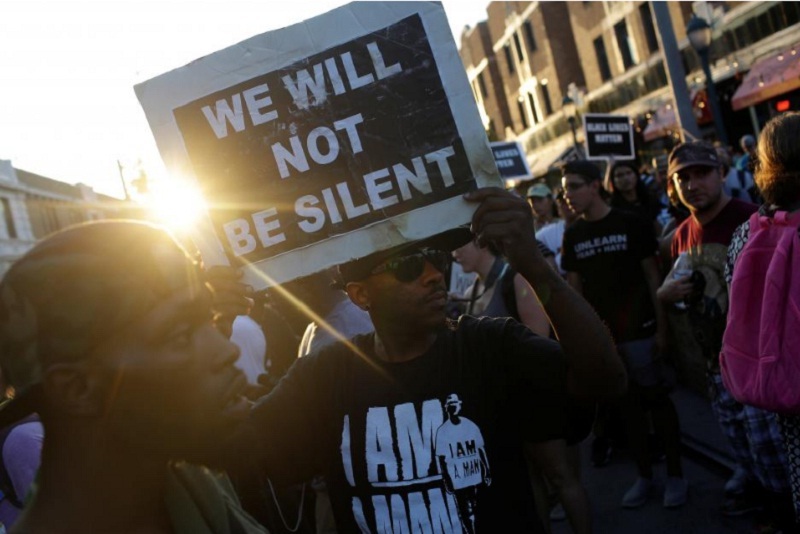 People march day after the not guilty verdict in the murder trial of Jason Stockley, a former St. Louis police officer, charged with the 2011 shooting of Anthony Lamar Smith, who was black, in St. Louis, Missouri, U.S., September 16, 2017. ST. LOUIS - Clashes between demonstrators and riot-clad police marred the end of what had been a largely peaceful second day of protest rallies in St Louis following the acquittal of a white police officer in the fatal shooting of a black man. Several hundred people had gathered near Washington University after dark as the main rallies and marches wound down on Saturday evening. And, as the night wore on violence broke out between around 100 chanting protesters, some holding bats or hammers, and police who ordered them to disperse. Several shop windows were smashed and trash cans were hurled at officers clad in riot gear, who moved the protesters back, having declared the scene an unlawful assembly and threatening to deploy tear gas. At least seven people were arrested. The demonstrations began peacefully on Friday after Circuit Judge Timothy Wilson acquitted former St. Louis Police Officer Jason Stockley, 36, of first-degree murder in the shooting death of Anthony Lamar Smith, 24. But as on Saturday, Friday’s protests had also ended in late night violence, with 33 people arrested following clashes on which 10 officers were hurt. “We don’t want to see property destruction or see people getting hurt,” Elad Gross, a 29-year-old St. Louis civil rights attorney, told Reuters as activists gathered peacefully at another protest site in a park on Saturday. “Deeply saddened at what has happened in St. Louis and having to cancel our show tonight,” U2 singer Bono said in a post on Instagram that cited civil rights leader Dr Martin Luther King. The latest verdict came about three years after rioting broke out in the St. Louis suburb of Ferguson when a black teenager was shot dead by a white police officer. That incident touched off a nationwide soul-searching over law enforcement’s use of force against African-Americans, the mentally ill and other groups. After Friday’s ruling, some 600 chanting protesters marched from the courthouse through downtown St. Louis, some of them holding “Black Lives Matter” signs. Stockley believed that Smith was armed, defense attorneys said, and a gun was found in the car. But prosecutors argued Stockley planted the weapon and the gun had only Stockley’s DNA on it. “This court, as a trier of fact, is simply not firmly convinced of defendant’s guilt,” Judge Wilson wrote in his ruling. Smith’s family settled a wrongful death lawsuit against the city for $900,000 in 2013, according to Al Watkins, an attorney for Smith’s fiancée, Christina Wilson. Clashes between demonstrators and riot-clad police marred the end of what had been a largely peaceful second day of protest rallies in St Louis following the acquittal of a white police officer in the fatal shooting of a black man.